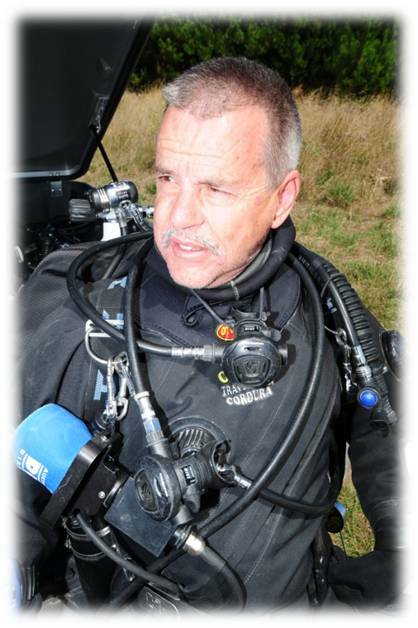 In announcing the Award, Terry said; “this award is given to that person who has made an unparalleled contribution to the industry and in this context also to the technical diving side of our wonderful sport”. He went on to outline Warrick’s career from 1961 when Warrick started SCUBA diving on a Dutch Navy twin set after many years as a spearfisherman. In 1965 Warrick joined the Australian Navy as a Clearance Diver. By 1966 he had started work at Victorian Aqualung Centre, one of only two dive shops in Victoria. Victorian Aqualung Centre grew into Sea Bee Wetsuits and Airdive Equipment – they were the first Australian wholesalers of ScubaPro, Mares, Sea Hornet, Undersea, Beauchat, Bauer and Champion to name a few. Sea Bee went on to become the largest wetsuit manufacturers in the world (per capita) at that time with over 60 staff. In 1972 Warrick first started diving in the Mount Gambier cave system and a passion was born that endures to this day. In 1977 Warrick joined Anchor Wetsuits which eventually became Melbourne Marine with 3 diving retail outlets. Then in 1979 he started Warrick’s Dive Centre, which grew to 4 outlets by 1985. In 1986 the store name was changed to “AB Ocean Divers” – and more recently to just “Ocean Divers”. Ocean Divers was a Finalist in PADI Asia Pacific’s Awards in the Categories of Outstanding Business (2010) and instructor Development (2009) and Winner of Diver Retention Award in 2009. In 1990 Warrick was elected to the Board of Dive Australia – the industry’s peak body of that time and served as its President for a record 5 years. Also and somewhat concurrently from 1989 and till 1996 (approx 7 years) Warrick was the President of the Dive Industry of Victoria Association. In 1992 and on to 1994 Warrick held the position of Business Director of the CDAA. Then in 1999 till 2009 Warrick held the position of National Director of the CDAA and in so doing became the longest serving Director of the CDAA ever. It is fair to say that under Warrick uncompromising style of management the CDAA was guided through some of its most productive years. Currently Warrick is a CDAA Advanced Cave Examiner and PADI Instructor Trainer and still travels regularly to Mount Gambier and beyond (Florida, Mexico, etc) – following the dream that is diving.